The Ark Watch Foundation is a nonprofit public benefit corporation organized for the purpose of engaging in charitable and educational activities. Celine Myers, Founder and President of The Ark Watch Foundation, started the organization in the fall of 2004. The incorporation process began in early 2005 and was completed on June 20, 2005 in the state of CA. The Foundation received its status as a 501(c)(3) charity in October 2006. The Ark Watch Foundation’s mission is to improve the welfare of animals in need within the U.S. and Canada. This is accomplished primarily by awarding grants to established rescues and sanctuaries that provide sanctuary to, or by other direct means, benefit or improve the welfare of animals. In addition, The Ark Watch Foundation oversees several projects of its own, including Knightsbridge Farm. 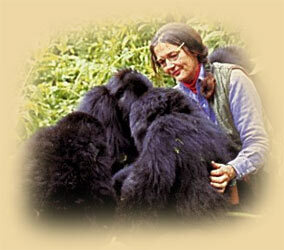 35mm films National Geographic researcher and close family friend, Dian Fossey, had brought to show the family. After spending months in the jungles of Africa studying her beloved gorillas, Dian returned to share her adventures in this mystical, beautiful, far-away land. As the images flickered past on the small screen perched in front of the fireplace, Dian provided informal narration and answered questions posed by her enthusiastic audience. Everyone in attendance knew they were witness to something quite extraordinary. Through this introduction to Dian’s work, coupled with her own love and concern for animals, Celine developed an awareness of animal welfare and conservation issues at a young age. Her experiences blossomed into what would prove to be a life-long love affair with the animal kingdom. Celine would come to believe that as humans, we are an integral part of the natural world around us and it is incumbent upon us to act as “keepers of the kingdom.” It would seem that without realizing it, the seeds for The Ark Watch Foundation had been sown. serving a term through February 2006. 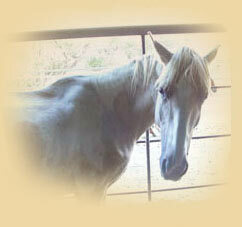 During this three year and a half year period, Celine rescued some 20 wild mustangs from a variety of situations. 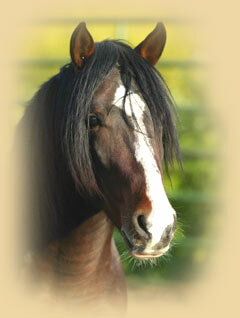 Many of the horses were deemed too old, too sick or too young to be adopted. Others were injured or simply left over at the end of an auction because no one wanted them. Working in collaboration with RTF’s Founder, Neda Demayo, Celine agreed to provide ongoing financial support for the horses and was able to ensure that they found safe refuge at Return to Freedom. adoption by the average horse owner, Celine purchased them and donated the horses to the Sanctuary’s Preservation Program. 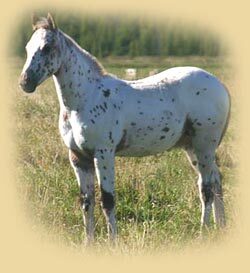 A beautiful Cerbat stallion from the group is one of only 70 Cerbats left in the world. Throughout her tenure as a Director, Celine worked to increase awareness of the plight of the wild mustang and raised over $500,000 in donations for Return to Freedom. In 2002, Celine also established a relationship with The Elephant Sanctuary in Hohenwald, TN. Concerned about the welfare of captive elephants in the U.S., Celine offered her assistance and financial support to Sanctuary founder, Carol Buckley. Through The Ark Watch Foundation and private donations, Celine has raised over $370,000 for The Elephant Sanctuary. Most recently, The Ark Watch Foundation awarded a grant of $100,000 towards the Sanctuary’s efforts to secure ten captive circus elephants known as the Hawthorn Elephants. For decades, when they were not being rented out to circuses, these elephants had been kept bound in chains and housed in a windowless warehouse in Chicago. 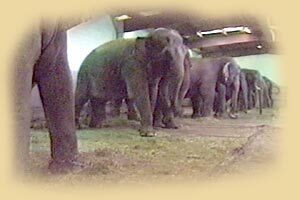 Thankfully through the persistence and extraordinary efforts of Carol Buckley and her staff, most of the Hawthorn elephants now reside at what can only be described as “elephant heaven” on the lush 2600 acres at The Elephant Sanctuary in Hohenwald, TN. For more on The Hawthorn elephants and The Elephant Sanctuary, go to www.elephants.com. 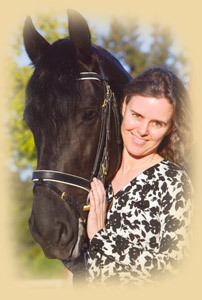 In the fall of 2004, Celine received an email that had been generated by a woman sending out a plea for assistance in placing 152 PMU (Pregnant Mare Urine) mares and foals. A Canadian PMU rancher was sending all the horses to slaughter in 72 hours if they weren’t sold. Having participated in several rescues already, Celine thought she would call the woman, Gloria Pearson, and offer a few suggestions on how Gloria might go about finding the horses homes. After speaking with Gloria, Celine decided to join her in the rescue effort and the two women hit the ground running. They were so successful at placing horses in the initial 72 hours that they asked for, and received, a 10 day extension. When all was said and done, the women had successfully placed over 110 mares and foals. Many other generous and kind individuals would step in to help ensuring no horse was left behind. In December 2004, Celine heard from a local Canadian feedlot owner about a group of 89 Spotted Draft mares that he was trying to purchase for slaughter. The feedlot owner wouldn’t divulge their whereabouts because he didn’t want any competition in the bidding process. It took several months, but eventually Celine was able to find this group of former PMU mares on a ranch in Manitoba. At the time, it seemed she was too late. The mares had already been sold to a horse trader who had consigned them to an auction house not far from the slaughter plant in Illinois. When Celine spoke with the auction house manager, he told her the mares would be sold “in the open pen by the pound.” He thought they would likely be purchased by the meat buyers. Thankfully the horses had not yet been transported from the ranch in Manitoba to the U.S. and after several discussions with the horsetrader, an agreement was reached. Celine purchased the mares literally 10 minutes before they were to be loaded on the liners and shipped to auction. Two weeks later, when the mares arrived at their new home in Alberta, it was discovered that most of them were pregnant and about 10 weeks from giving birth. Many of the mares arrived in poor condition and were in need of special care. At this time, the decision was made to provide permanent sanctuary to the older mares and in so doing, Knightsbridge Farm was born. In addition to the 320-acre home ranch another 500 acres of pasture was leased for the year. 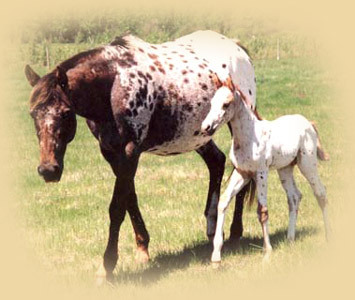 Throughout the spring and summer months, the pregnant mares gave birth and raised their foals on the lush grasslands of the Northern Rockies. The original intent was to have trainers work with the foals and the younger mares from the group of 89 Spotted Drafts and then sell them to loving homes. The proceeds from sales would go to the Ark Watch Foundation to assist in supporting the Foundation’s grant making efforts and help underwrite the Farm’s operation. When a buyer purchased a young mare or foal from Knightsbridge Farm, their check was made out to The Ark Watch Foundation. The process had been ongoing over a two year period and a number of the foals were sold but after months of living with the herd and observing their interactions, it was determined that the group would be best kept together in its entirety. This was essentially one very large family group with most of its members related to one another. 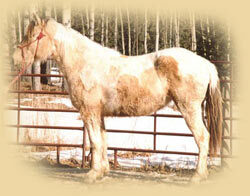 Some of the older mares had served on the PMU lines for decades and had been pregnant as many as 20 times. 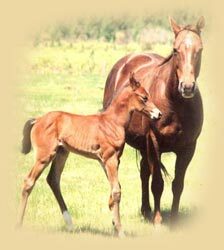 After giving birth they had most of their foals taken from them when the foals were just a few weeks or months old. These horses had spent their entire lives in service to their owners and the greater community of women by providing the urine to manufacture hormone replacement therapy drugs. We felt their work should be honored and they deserved to live out their lives with their surviving offspring and family members. In March 2005, Celine received a call from her Canadian contact asking if she would be interested in purchasing a group of 10 registered mares that were coming in to the local feedlot. The feedlot owner had called and said the PMU rancher was coming in to drop them off later that same day. The rancher thought most of the mares were very pregnant. Celine decided to purchase the mares, and in so doing, she started The Ark Watch Foundation’s Rescue Fund. The Fund would provide the means to purchase slaughter bound feedlot horses that were young and healthy so they could be placed. Over the next several months, Celine rescued another 40 or so mares, yearlings, foals and geldings from the feedlot. With proceeds from the Rescue Fund, she rented 160 acres to pasture the horses and give the mares a place to give birth and raise their foals through the spring and summer. cover the purchase and transport of many of the horses. Still others were sold through an intermediary to a Southern California PMU Placement Group. Two young, flashy black and white mares, Sugar and Newfie have appeared in several local and national publications. 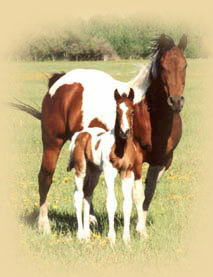 one of the original group of ten, had given birth to a stunning leopard colt. 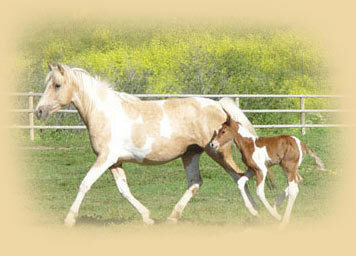 Celine named the mare, Maya, and her colt, Spirit. The Ark Watch Foundation has retained ownership of Maya and Spirit and they have become the “poster children” for the Rescue Fund. 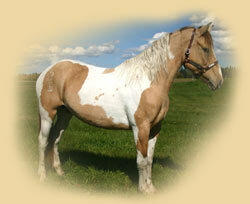 They illustrate the outstanding quality of many Canadian feedlot horses. Celine Myers has a B.S. in Finance from Santa Clara University with an emphasis in real estate finance and international investment. She lives in Los Altos, CA with her French Bulldogs: Annabella, Benjamin, GoGo, Cosette and Mr. Wiggley.